This was an interview that was done when the documentary Living dot Com came out. Audio and transcript below for your listening and reading pleasure. Hey guys this is Michael and in this podcast I’m sitting down with a very successful Internet entrepreneur, Ian Fernando. 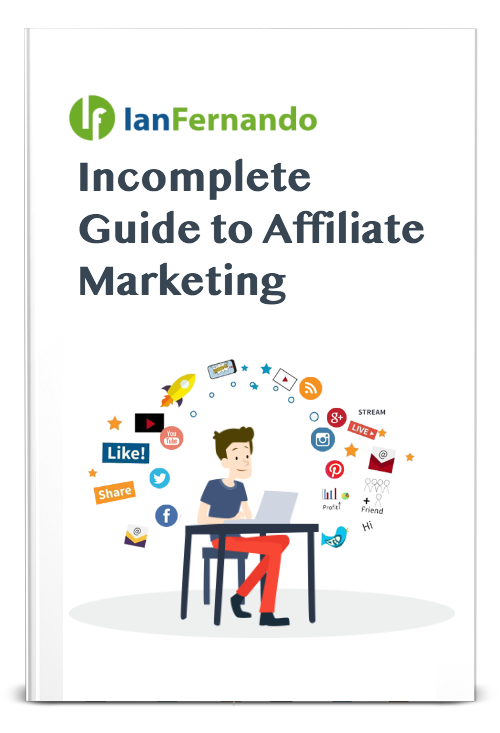 Ian has been a successful affiliate marketer and he also creates his own products that he sells online and sells to other affiliates, so he knows both sides of the aisle here in affiliate marketing. He’s been an affiliate and he’s also been a product creator. Ian has a blog in line where discusses different aspects of the online marketing world it’s at www.IanFernando.com. I’ve put a link below in the description box definitely take a look at his blog after listening to this interview. This is actually another podcast I did last summer after he premier screening of Living Dot Com. Ian watched the movie and he gave a feedback on his blog so I contacted him I saw his and said, “hey look Ian I’d definitely like to sit down and do a podcast with you to get your views of the movie and obviously your views of the job market and how are things going on right now in affiliate marketing and what opportunities exist out there for today for someone wants to get started”. So here is the interview I did with Ian Fernando and enjoy the interview. Michael: How are you doing? Ian: I’m doing good, thanks for having me on here. Michael: Thank you for coming and I really appreciate all your feedback for the movie and let’s dive into it. So could you just give us a little history of your background, how you got started online and what you do? Ian: Yes sure, so I guess I’ve been online for about maybe 10 years and then 8 years about maybe full-time. I basically started with the eBay business and before I get into this online stuff I want to say online definitely a lot of work and the reason I got into is because I want to change my lifestyle and with the eBay business I was working 3 jobs just to have an apartment after… you know my parents kind of got into an argument with me because I didn’t want to finish school. So it was time for them to just kicked me out and so I basically decided okay I can do this, 3 jobs and later just sit in my room I’m like oh man this can’t be the American dream I can’t just work 3 job. So I just did basic research and the first thing that came in Google search was eBay, so I started buying stuff at flea markets, baseball cards, low-cost clothing and sell them on eBay. Then I figured out, oh I could probably do this in bulk and get it cheaper and after doing that I wasn’t able to handle customer care, I wasn’t able to handle supported just because I still had my 3 jobs it wasn’t able to at least remove one job. But long story short after that I basically started doing product creation, digital online creation. I started selling stuff through Myspace, create my own mini first website through Myspace again with that is so I couldn’t deal with the mass volume of people ordering products by myself and it would just happened so quickly and sporadically that I didn’t have time to research while I was working so in the end I started doing affiliate marketing. And affiliate marketing was my niche and I’m pretty known for being an affiliate are you know high-end CPA network and that’s where I started and got my success out of it and now currently I own multiple products physical and local products and I now have a data team that can handle customers, four call centres, product inventories and all that stuff now so it’s just the whole process I started to get into them. Michael: Well actually Ian I want to go back to kind of to the beginning when you were working 3 jobs, you started selling things on eBay. How long did it take you till you were able to support yourself? Ian: I would say I was able to support myself knowing that after I still had the 3 jobs affiliate marketing was actually the one that was able 100 dollars a week to 1000 dollars a day. My EBay was probably just may be spending money after paying off my rent with the three jobs and all that. So I wouldn’t say it was pretty quick honestly and that’s a surprise, because I did it within my first year. So once say under 6 months I was able to get sustainable people consistently buying from me and on eBay I still have 100% customer satisfaction. Michael: So let me ask you, how did you learn about affiliate marketing? What gave you the idea to do that? Ian: So with the products on eBay and making my own Digital Products I had to cater to the consumer and still having two or three jobs at that point in my life I wasn’t able to concentrate 100%. And the consumers are the ones that make your business technically and if I couldn’t support them and answer the questions and time, complaints refunds and all that kind of stuff. So I had to really think about okay what is there product there? I don’t have to do anything except just give somebody else to lead and I stumbled upon forums and people kept saying affiliate marketing so I was like, okay I can do this, I started off with CJ.com and link share I did fairly well with them on cost for sale and or CPS side. But then it went to the point where it was so minimal, because it was only 10% commissions of actual order that I’ve been really helping too much… I would’ve went back to my Digital Products and cater to the consumers more so and take complaints but I figured, okay let me just try to find something else and then I stumbled on, the network is not really existing right now but it’s one of the top 5, _ads and give actually taught me to look at PVC and look at media buys and look at paying traffic sources and with that my affiliate management was able to get me from roughly 100 dollars a week to 1000 dollars a day and that was my big break after that I was able to knock one job out of three and to bring them down to two and then bring them down to one. I kept the one job just for you know what, this is an Internet thing I’m not too sure about this and then I called Anna like you know what I’m going to do this full-time because issues I was having is a job then took a six-month risk and after that 6 months I never really looked back for another job so I’m pretty satisfied. Michael: So you’re saying that since this time for the last 10 years you’ve just worked in this business, I mean you’ve obviously created other business, but you never went back you only went forward. Ian: Correct yes, I’ve always basically went forward I started from the bottom and a basically cater to the aspects of affiliate marketing or marketing itself and now at the top actual product owner person. Michael: And when did your parents think it was okay that you didn’t go to college then? Ian: I don’t know what I mean my parents are still not… We see each other, but we really don’t talk much. I mean our relationship is still rocky; they’re very traditional I’m a first-generation immigrant. They are immigrants and they came to this country and expect hard work to this, do this and that and I think both my parents are Bachelor’s degree and they graduate and to them I am a non-grad basically not really disgraceful more of like I’m going kind of backwards even though I know for myself I’m going forward. Michael: You know and that’s something that I feel that a lot of people in our generation are facing because my grandfather was an immigrant as well, actually both my grandparents and education was very ingrained into having their kids you know go up the ladder and they always thought that was way to do it, but then again we’re seeing a lot of kids in our generation that are going to school get a student loan debt and they don’t have jobs so it’s… I mean I totally understand my mom as well and I speak to her about you know may be education is not… I’m not say not worth it but it’s not guaranteeing you the success in the past and my mom her solutions everything is get more education if you already get a bachelors you somehow get a Masters or PhD you even get a better job and this is not true. Michael: True it depends kind of on the situation of the person and what they’re trying to do, but I guess you know at the same token it can’t, I mean me personally if you look at also maybe his degree, the student loan debt what are you majoring in? Like you said it’s not to be something that comes out to a job that you can afford yourself living, I mean I have friends word 50, 60,000 dollars in student loan debt you know the job and the monthly payment it’s crushing them. Ian: Yes I know my sister is in that same situation; she graduated 4 years bachelors but she has a think like a 40 K loan and then she’s struggling sometimes I feel bad I feel like I want to just pay that off and help her off, but I also want to make sure that she’s learning the aspects that this money didn’t come freely. So yes, I mean I agree it’s… I know a lot of friends that graduated and then just stuck of the payments. The funny part is, here’s something to add, I was at my high school reunion and this is just a very funny interesting story is that when I went to my high school reunion and people asked you so what have you been doing in the past 10 years, oh I travel the world, I own three companies, I recently just sold a software company, by the third person that asked the question I was at I’m doing well, because by the third person I felt like I was condescending on people and so when they told me what they were doing and I felt like all man this isn’t good and you know I look at that we both had 10 years to improve ourselves, what’s the difference between me and you? You know we all had equal 10 years there had to be something we had the same equal opportunity to do something yet you’re still stuck while I’m above. So the kind of question just out of myself all the time why can’t do better? Michael: You know and that’s part of the reason background of the movie and everything why I decided to pick the subject is I personally started an Internet business about 6 years ago making explainer videos, doing promo videos and promotions and stuff like this and a lot of my friends too are like… I was living in Peru have the year and the United States have the your my mom is from Rima and we spoke about this before, you know the flexibility people just especially a lot of people like my uncles and aunts the can’t stop just have fun at the beach do nothing all day. Just because I’m not in a cubicle so I mean just the way we work and the things we work on is changed tremendously and I kind of want to follow that up with a question to you, because you know you travel a lot how do you integrate your businesses with your ability to travel and things that that? Ian: Basically systems, I’m a very fan of automation and systems; out of my partners I’m the only one that is basically more remote. Two of my friends are in New Jersey they go to office and the care to employees. I take the side of closing deals, talking to people, _ back ends, the leads. I can actually do that stuff from anywhere; my partners can do the same thing as well while one specifically had to be with the employees and the fact that I was able to… Let’s just talk about it this way, when I had my affiliate business I was able to do on in online marketing wherever because all I need was an Internet connection, an outsource team that I had and just a Mac and it was easy to do everything online, I didn’t need a phone I had my cell phone, I had _, I need a wonder list team to make sure the task were given properly to my house ware team, my project manager person to make sure my houseware team are doing what they need to be doing. So I think be strategically organized to where it needs to properly flow the way you want to follow, me being_ I’m very organized and I like to be systematic just because I don’t want to be looking at my whiteboard and looking at my wonder list and like all these things don’t match what’s going on and being a cluster clock on what’s happening with my task. So it’s more so like being organized making sure that you know what you want or the end goal. So you have a vision of the end goal then you’re able to reach it with being organized, strategically organized anyway. Michael: Let me ask you this, how many hours a day did you work? Ian: Right now I probably work 4, 5 hours a day; when I’m on vacation two hours, one hour. Michael: And you’re able to make you said before 1000 dollars a day if not more? Michael: Impressive so kind of just based off of this where we were talking before, when you reviewed you said that you wished to go a little more into you know the 1% versus the 99% and I was reading an article today in Hudson’s post and was explaining how you know the minimum wage in the United States is now $7.25 an hour and this is how much people working at Walmart and people working at McDonald’s you know these types of jobs are what are making and the article was going on about how economic growth in the United States is going to slow down because people aren’t making enough money to afford to buy anything anymore, how do you think with one end of it we have automation and these type of things doing these tasks that people use to do which is_ the wages on the other hand people were creating the products, people who are marketing the products like you are making a lot of money. What do you think would be a solution to the problem? Do you think raising the minimum wage of the solution? Ian: No definitely not raising the minimum wage, because the problem with that I would tell you this people would be wanting to get more and raise from a minimum wage with no improved skills that. So when I have a job I understand that in order to get a raise I had to show myself 110%, I had to make sure I was the best, that I was not pleased with my job and if they wanted to fire me they had to take the 1 to 2 years to find the perfect person, because I set the bar for that company. Now for somebody to complain that they are getting only 8 dollars and they’re are a cashier what skill sets do you need to do to deserve another 8 dollars for a 15 dollars an hour raise. I mean it’s very argumentative, I think that you have to have the hunger to earn what you want and that’s how I saw it when I was younger when I had a job. If I wanted to be… When I was a waiter if I wanted a big tip I would entertain people with their kids, and make sure the food was on time, and make sure they are taking care of. When I was in the call center and always make sure that I was taking a bunch of calls and make sure I reach the days end limit. So the problem I see and correct me if I’m wrong I think the economists is saying that technology is replaced and everybody is because that it’s cheaper and the reason why we’re doing this because people are complaining about raising the minimum wage. If we’re going to raise the minimum wage there could be no jobs because us business owners we’re going to think about you know what we can just sort this out somewhere else or we can make a program or software and get the job done right. So you know if you can’t prove your strength and you can’t prove yourself that you are the best or you can’t be replaced then that’s where you deserve something more than the minimum wage maybe they’ll upgrade you in the company somewhere. I just don’t like this arguments that the 99% maybe because of the fact that they want satisfaction, they don’t want to work hard to be you what they really want and don’t get me wrong I know a lot of people that work out for example_ but then they are a part of the union which also dedicates how much you really can make_ so there’s other things in body but for me I think it’s more like how hungry do you want to be, do you want to have ribs tomorrow for dinner or do you want steak and lobster for dinner? Michael: How you… Not let me say this, you figured it out unless I mean I’m very impressed with your story, I think it’s something that everyone can learn from. How would you you know let’s say I was someone that was 18, 19, 20 years old and I’m getting jobs for $7.25 a hour, what would you tell me to start? Michael: Like we said before though, I mean those days, I mean minimum wage$7.25 an hour before that used to be I remember even in the early 90s you know you could support a family off of a factory job now it’s impossible. Ian: Yes I agree, but back in the day I think it’s more like you picture this this American dream, you’ve got your pension, but now since the US is in debt and financial crisis. It’s like you don’t have pensions anymore your limited on how much_ for a while. So all that stuff kind of just about dissolve in a way as the years go on. We are going through a financial crises every year for some reason, so that’s one aspect people don’t realize they think that their companies going to take care of the when the company can be like, you know what, we’re going to shut down and pay everybody X amount, a severance and then that’s it what’s next? Ian: Yes it is scary, because you’re basing your life on the money that was consistently coming in. It’s like, I don’t know if you’ve seen the documentary broke 30 and 30 broke about NFL player that are becoming broke just overnight, it’s basically like these guys they get signed for a 5 million dollars and they just then they have a 3 or 4 or 5 year contract for 10 million dollars. So they assuming they’re going to get 10 million dollars so they start blowing up their money not knowing that if their team doesn’t make it to the Super Bowl they can be signed off or let go and knowing that they were supposed to if they make 10 million off the contract over the 5 years. they are only making X amount for the years they’re on the team and that’s where these football players were just going broke, because they were just spending their money without really thinking and I think that’s what’s happening here especially in America, because Americans are very egotistic, they want to compete with the person that’s walking next to you, you know, he got a Rolex, I’m going to get me an AP watch or a Hublot just because he has one. When he probably knows he doesn’t have the money for it. Credit cards, all that stuff are also influencing their decision. So if you added that stuff like in a living Dot Com why? I would say the egotistic mentality of Americans definitely want to compete and a lot of people see it, but they see it for a lot of reasons. You see people that are broke there saving money for Jordan’s, for shoes when they can’t even take care of their own families, it’s like dudes you’ve got these priorities, it gets me a little agitated, sorry. Michael: I completely agree with you, I mean one way if you look at the investing or saving money I’ve always said this, you know not just frivourously spending money on things to make yourself you know whatever look better or look cool, but I mean at the end of the day you can spend your money and that you could put it in a bank and think that a banker is going to magically make you money, you can invest in a 401(k) and think that some financial advisor is going to make you money or you can invest in yourself. I mean you’re a great example of that you know you learn these skills SEO, affiliate marketing and slowly like he said put this in, you’ve got this back you learn all the way, you can’t take this away from you, a financial crises cannot take that information out of your brain. I mean if there is a financial crisis that happened tomorrow and all your investments went to nothing you have all that experience where you could make your money back the next day. For somebody who worked at a company his whole life and he just save his money through the pension, the company goes broke the pension gets wiped out, his skill sets worthless I mean where does that get them? Ian: Correct I agree and when I was working this one guy he just went from Telecom and I remember when I left at company he was asking me for a referral for telecom and I was like sure why not? And then I talked to like dude what are you doing? He said I’m just going to Telecom trying to get back to what it was doing in sales. I don’t want to… I could just show you a little bit of what I do and that’s cool but then after a week of conversation he’s not into it, like dude theirs is so much learning about the type of job. I mean that’s your decision to really be satisfied and not learn a new skill set that can help you later on and forever or I can teach you, we could sit back, take the risk of losing time between you know your family, not saying take too much time but I mean just take a small portion to invest that time to learning affiliate marketing. And a lot of people don’t want to do that they are satisfied, they think that if they were a Telecom analyst at least they can get another Telecom analysts, but then you’re not guarantee the same salary as you left that first company, if you were making 80 K this companies probably going to hire you for 60 and you’re going to want 80 because you are worth 80 because you worked at a first company for 5 years and a lot of they don’t want to start from the bottom again they’d rather start at the top and that doesn’t work in the job market. The business owner does not know you, the managers does not know you, they don’t know you’re worth that, they have to give you a starting point and that’s where it brings it back to our first conversation where take that starting point and then just prove to that job that you are the best in the business and you raise the bar 110% that your irreplaceable. But in the end also maybe take a little time out of your lunch break and learn new skill set you know, 30 minutes a day can mean wonders after a year or even wonders of the, so there are two types of people, people that want to do more and people who are just satisfied. Michael: I completely agree, the only problem is like I said the Telecoming for instance for example and now your voice software that cause if you know stuff like this I mean it’s getting harder and harder to compete which brings me to our next question I mean one of the opening quote in our movie and this is really shocked me, there was an Oxford study and they said that 45% of jobs in the next 20 are going to be automated, 45%, almost half. That’s mind blowing to me to anybody who can think they can sit back and think that this is everyone is going t to be taken care of, I think they’re in for a big surprise it’s going to take one more big financial crisis which I think is coming, you hit it on the head, I mean we have debts going to the sky and I mean people don’t even.. That so can still going to have this. I mean I think that’s one more big crisis and you can see unemployment reach terrifying heights. Ian: I definitely agree and definitely a big percentage, but I mean overtime when I was in this industry it makes more sense because technically a desk job is a repetitive work every day, a sales job is a repetitive work every day, a data analyst job is a repetitive work every day and anything that’s repetitive can technically be programmed and automated or sourced out for far cheaper. And so I remember when I was at my telecom job, I was doing data analyst and it was just so repetitive for me my brain is just like all this is just so boring I can do this. So what I did I started learning Excel and formulations and within literally a month are probably 3 months I’ve automated my daily task. I took my nine hour job and actually made it in two hours and at that point the next six hours I was slowly you know working on my affiliate campaign, logging into Google looking at my PVC campaigns. My work for the day was already done, so yes I see this automating stuff happening. I’ve done in the past but I don’t like repetitive work and that’s a problem people are put in a job to just do minuscule repetitive work and business owners come to a point where like, dude you don’t want to do this anymore you can give it to somebody and pay them a cheap salary a very cheap salary and just do it or just invest in automated software is that it can do it for you. Michael: We are just getting to the beginning of this, I mean, that’s another aspect the professor was talking about is just starting; we’re just getting the tip of the iceberg. I think it’s going to be scary but at the same time you’re proving a great example use creativity and learn these Internet skills and stuff like that you could form new products and I think one aspect that I learned through this movie was you know if we’re going to have more time on our hands because more jobs are being automated or you know done by software stuff like this, you know there’s new industries and I really noticed that like self-actualization products I don’t know if I’m correct like I call it self-improvement like eating healthier foods, or being healthier yourself, help stuff for dating stuff or how to prove your relationship that kind of those type of products are becoming more popular because people are having more time and these are industries that I think that makes sense at this point. Michael: I agree it’s mind-set and people have to be…they have to see it they see examples of it people live better lives because of it and stuff like that. Michael: That’s cool, Ian I don’t want to take any more of your time your stories extremely inspiring. I learned a lot speaking to you and just going away, just one last question about the movie. Do you think it’s something or let’s say someone you know has no idea what the whole Internet marketing industry, do you think it’s something that someone could watch and learn more about and get inspired? Michael: Exactly, well I really appreciate everything Ian and best of luck with everything and definitely keep in touch, I want to keep up with your blog now after hearing your stories. So if you need anything to give me a shout. Ian: No problem man I appreciate being on the podcast thank you. Hi this is Michael I hope you enjoyed this video if you’d like to subscribe to our YouTube channel you can do so by clicking the subscribe button on the screen right now. First Sales on eBay for the New Year. Might be Easier than Affiliate Marketing?